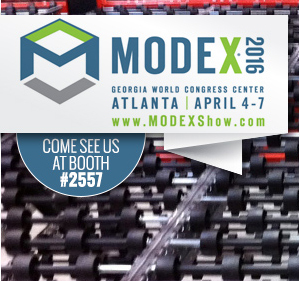 Next Stop… MODEX 2016 -Meet Us at the Mallard Booth, #2557! MHI refers to MODEX as the “Greatest Supply Chain Show on Earth” and that’s no exaggeration. There will be 850 leading manufacturing and supply chain providers exhibiting their products and solutions for industry professionals over the course of four days. Mallard Manufacturing is thrilled to be part of this event and this industry and we like nothing more than solving a material handling challenge. Our team will be in beautiful Atlanta Georgia from April 4-7 looking forward to connecting with our customers and industry partners and hoping to crack some storage and fulfillment mysteries. We will be displaying a number of our different gravity flow solutions including for pallet flow rack, carton flow, gravity conveyor and our new Pallet Flow Separators. Nothing explains Mallard products better than seeing them in action so make sure you stop by Booth #2557 for a visit. To contact a Mallard Gravity Flow Specialist before or after show dates, call 1-800-243-6694 (US Only)/ 1-815-625-9491 or email info@mallardmfg.com. We’re looking forward to seeing you in Atlanta!